Chopper is an intergalactic bandit, also known as Jitsu. He was broken out of Prison Starr by Keldor during the Great Unrest. In gratitude, he agreed to serve the Evil Lord of Destruction and stayed with him even after Keldor’s transformation into Skeletor. As a master of several forms of martial arts, Jitsu was often on the frontline in battle against Randor and his Masters. 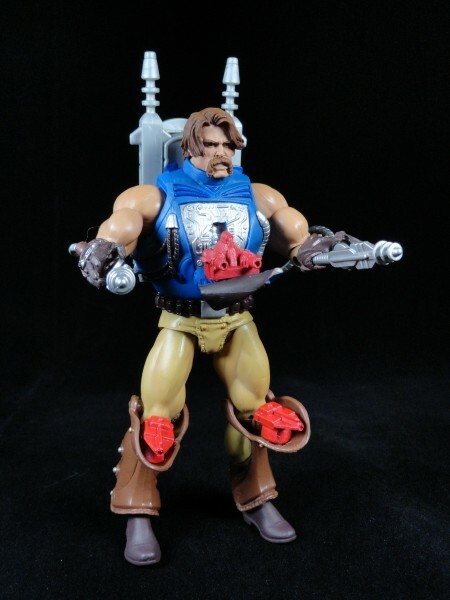 During the Battle for Gretori Bridge, he was wounded by his archenemy Fisto and had his hand replaced with a golden robotic implant by Tri-Klops. 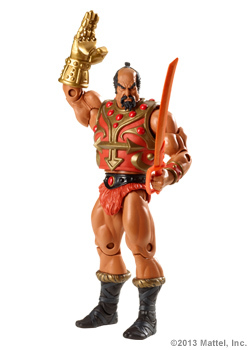 After Skeletor left Eternia for the stars, Jitsu took over Snake Mountain ruling it with an iron fist. As deadly as he is silent, Jitsu uses his chopping power to get his evil way! Multiattack. Jitsu makes two attacks per round. Golden Palm. Melee Weapon Attack: +5 to hit, reach 5 ft., one creature. Hit: 11 (2d6+3) slashing damage. Katana. Melee Weapon Attack: +5 to hit, reach 5 ft., one creature. Hit: 9 (1d10+3) slashing damage. Ki Strike (Recharge 5-6). Melee Weapon Attack: +7 to hit, reach 5 ft., one creature. Hit: 26 (6d6+5) piercing damage. And creatures have disadvantage on their attack rolls against Jitsu until the beginning of his next turn.